We are currently offering an online professional development opportunity for our teachers: the Digital Learning Labs. Right now, we have a group of 35 teachers finishing module 1 | Google Drive. There has been a very high level of engagement in this module, with lots of interaction and discussion about possible applications and uses of Google Drive in our professional practice, in and out of the classroom. Registrations are now open for module 2 | Google Docs. Many of the folks taking module 1 are moving on to take module 2, as well, for they feel the need to keep developing their knowledge and skills on these tools. If you're interested in joining our learning party, click HERE and fill out our registration form. We ask you to please join by no later than August 27th. Lab modules go on for about 2 weeks and are 100% online and self-paced. They are a great opportunity for those of you who need some introductory hands-on experience on these core Google tools: Drive, Docs, Slides, and Forms. 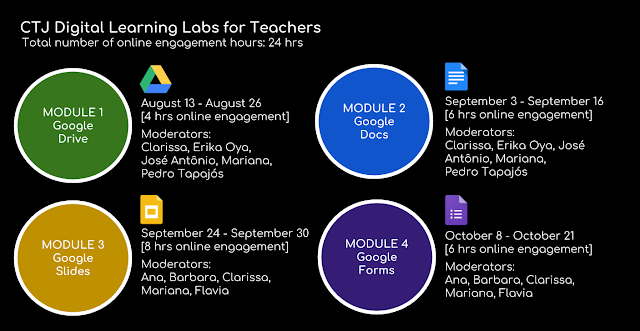 Below are the dates of all Learning Lab Modules. We hope to see more teachers beginning their Vision 2020 learning journeys by joining this fun and productive learning experience.